Research Tuesday: Can CCC-2 be used as a screener to ID LI in young children with ADHD? nword and sentence repetition subtests”. For example, on the CELF-3rd Edition, children with ADHD performed below typically developing peers on the Sentence Recall and Sentence Formulation subtests, even though overall composite scores were within normal limits. In comprehension tasks, children with ADHD exhibit slight deficits in making inferences and “monitoring comprehension of task directions”. On the other hand, children with both ADHD and LI exhibit “more pronounced difficulties in receptive language tasks and perform on standardized tests more like children with SLI than children with only ADHD”. When assessing narrative skills, children with ADHD and LI or children with LI only, are observed to exhibit poorer organization, shortened length of narratives, difficulties in planning and formulation of stories and even confusing story episodes. When assessing conversational skills (semantics, syntax, and conversational use of language), children with SLI (or children with comorbid ADHD and LI) were observed to exhibit reduced vocabulary repertoire, shorter sentences and more verb tens errors than children with ADHD (only) or typically developing peers. With that said, deficits in pragmatic skills (i.e. talking too much, interrupting others, not matching language to communication partner, etc.) are observed in children with ADHD regardless of the fact that syntax and semantics may not actually be affected, thus resulting in difficulty with maintaining conversation. 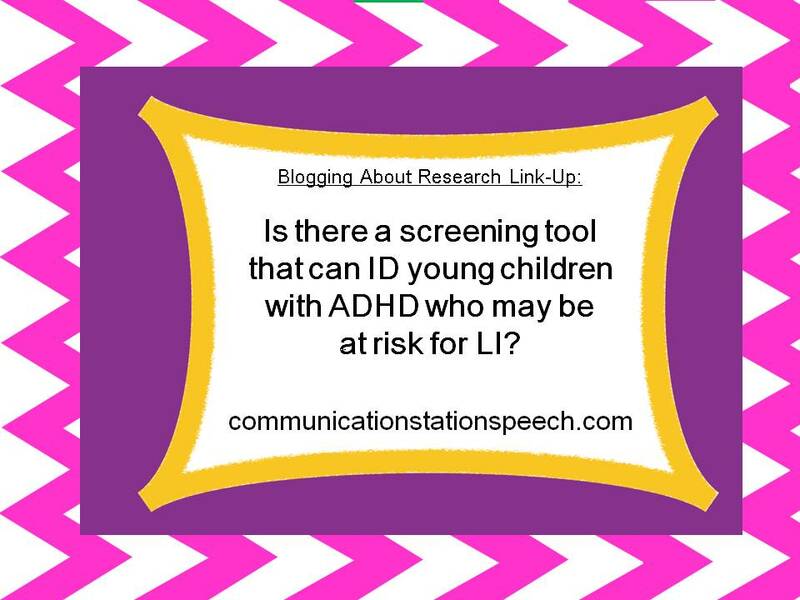 Due to the diverse nature of language and pragmatic skills children with ADHD and LI (comorbid or not) exhibit, this study was conducted to see there was a current screening tool on the market that could ID children who currently have ADHD who are at risk for LI. Participants: All participants had to pass a hearing screening and the phonological screener on the Test of Grammatical Impairment. Control Group (typically developing peers): 12 participants (6 boys, 6 girls) ages 5;1 to 8;4, obtained via flyers posted in the community. No participants were receiving special education services. All were given the Kaufmann Brief Intelligence Test and scores for nonverbal IQ ranged from 82-103. Experimental Group: participants were recruited from a clinical research sample whose families were about to enter an intervention study at a university-based clinic. ADHD diagnosis had to be confirmed by an outside evaluation by a doctor and developmental pediatrician. This group had 32 children (27 boys, 5 girls), between the ages of 5;7 and 7;9. Six children had been prescribed stimulant medication. Three children were receiving support services under “Other Health Impaired” and two children were receiving services under “speech and language impairment”. No children were enrolled in full-time special education services. The WISC-IV was administered to determine IQ which ranged from 73-135. Procedure: Parents completed the CCC-2 and a case history form. Participants participated in two or three sessions (60-90 mins/session) where two language tests were completed and a 12 minute language sample was recorded. The language samples were transcribed by research assistants blind to whether participants were in the control or experimental group. Measures: CCC-2 is used to ID children with SLI, pragmatic LI, and assist in ID children with ASD all for further evaluation purposes. This test is for children 4;0 to 16;11 who speak sentences and whose primary language is English. This test has 70 items in which the caregiver provides a 4 point numeric score to assess the following areas: speech, syntax, semantics, coherence, initiation, scripted language, context, nonverbal communication, social relations, and interests. Results yeild 2 scores: the General Communication Composite (GCC) (M=100, SD=15) and the Social Interaction Difference Index (SIDI) (WNL= -10 to 10). SIDI “scores ≥ 11 suggest syntactic/semantic skills are deficient and relatively poorer than pragmatic skills, whereas scores ≤ −11 suggest pragmatic language skills are deficient and relatively poorer than syntactic/semantic skills”. The latter scoring suggesting a profile associated with ASD. CELF-4 was given as one of the language assessments to determine if evidence of LI were exhibited by any participants. Only the first four subtests were given (Concepts and Following Directions, Word structure, Recalling sentences and Formulated Sentences) to determine the Core Language Score as according to the manual. TNL (Test of Narrative Language) was also given to assess narrative skills (narrative comprehension and oral narrative scores obtained). Language Sample: A 12 minute language sample was obtained including a personal retell segment, an expository segment and a narrative retell segment. The sample was transcribed by two research assistants and rechecked and discrepancies discussed by two additional research assistants all blinded to which test group the subject belonged to. Results: CCC-2 GCC scored ID’d all 10 participants who had ADHD and LI comorbidly. Five of these participants also exhibited markers of LI on their language sample. Four out of the five participants who were receiving services in school demonstrated LI according to these GCC scores. From the 4 participants with ADHD who scored above 85 on CELF-4 and TNL, three of which exhibited pragmatic LI according to the SIDI score and the remaining subject exhibited language sample measures below 1 SD suggesting clinical markers of SLI. One subject, who was part of the control group, received a GCC of less than 85, however his performance was WNL on all language measures tested. Discussion: The results of this study provide preliminary support for the use of CCC-2 as a screening tool to identify young children with ADHD who may require a comprehensive language evaluation. It still goes without saying that a comprehensive language assessment should be conducted to determine if LI does is in fact exhibited. Limitations and Research Implications: There are limitations in this study. The first of which is the recruiting method of participants. Parents who were participating in the university research clinic intervention are already observed to be involved in their child’s development and suspect a problem already exists. Therefore, it is possible that parents in this study may be more readily accepting of reporting deficits in their child. Also the age of participants is an additional limit to this study. The effective use of CCC-2 to determine older children with ADHD at risk for LI remains to be seen. It would be advantageous for researchers to attempt replication of this study for validity purposes as well as replicating this study on a larger scale with a wider range of ages to determine if in fact the CCC-2 could be a possible tool used for older children as well.